A computer simulation of two black holes merging. The simulation shows the gravitational waves caused by this event. Credit: Max-Planck-Institut für Gravitationsphysik (Albert-Einstein-Institut). 1.3 billion years ago, in a galaxy far far away, two black holes circled each other. Each black hole was around 30 times the mass of the Sun, but less than 300 kilometres wide. They spiralled around each other at about half the speed of light, until finally they merged in a collision which in less than a 10th of a second involved more power than 50 times the total power output of all the stars in the Universe. The catastrophic event caused gravitational waves – ripples in the fabric of space and time – that rang out at the speed of light across the Universe. 50,000 years ago, when the Neanderthals were walking on the Earth, these gravitational waves reached the edge of our galaxy. Unlike light from distant cosmic events, gravitational waves emerge from their journey through intergalactic space undimmed as they are not absorbed or scattered by anything they pass through. Two years ago, on 14 September 2015, these gravitational waves emerged at the two LIGO detectors in Louisiana and Washington, USA, and provided our first observation of gravitational waves, our first direct evidence for black holes, and the beginning of a whole new era of astronomy. The idea of gravitational waves goes back a hundred years, to the time when Albert Einstein changed our understanding of the Universe with his general theory of relativity. A consequence of the theory were two predictions: black holes – which occur when so much mass is compacted into such a small volume of spacetime that spacetime becomes infinitely warped (see here to find out more); and gravitational waves (see here for an introduction). The possibility of black holes greatly troubled Einstein, and he thought gravitational waves too weak to ever be detected by humans. This is the story of how he was wrong. Up until that momentous day in 2015 advances in the study of black holes and gravitational waves had come about through theory alone. Kip Thorne, of the California Institute of Technology, was one of the key players in the "golden age" of black hole theory, during the 1960s and 1970s and was one of the recipients of the 2017 Nobel Prize in Physics. At the time cosmologists, including Thorne and his colleagues at Caltech, were also imagining what gravitational waves could possibly tell us if we could only detect them. Much of our knowledge of the world around us depends on light — it's what enables us to see. Something similar goes for the Universe as a whole: our knowledge of it is based on electromagnetic waves, which include visible light. Gravitational waves are inherently different. While electromagnetic waves are easily scattered or absorbed by objects they meet on their journeys, gravitational waves never are, at least not significantly. "Electromagnetic waves are so different from gravitational waves, the electromagnetic waves are seeing aspects of the Universe that are by and large quite different from what gravitational waves will 'see'," says Thorne. Gravitational waves therefore promised glimpses of things physicists had never been able to explore before. They promised surprises and, because they can travel through the fabric of spacetime unimpeded — perhaps even glimpses of the birth of the Universe. The LIGO Laboratory operates two detector sites, one near Hanford in eastern Washington, and another near Livingston, Louisiana. This photo shows the Livingston detector site. Image: Caltech/MIT/LIGO Lab. These alluring prospects, improvements in technology and a better understanding of the events that might cause gravitational waves caused scientists to think again about how one might detect them, despite Einstein's initial pessimism. In 1972 the experimentalist Ray Weiss of MIT published a paper that proved a milestone. "It is really the most brilliant technical paper I have ever read," says Thorne. In it Weiss meticulously considered all things that might trick a detector into thinking it had detected a gravitational wave when it hadn't — all sources of noise — and worked out how sensitive the detector would have to be to deal with them. Weiss proposed a gravitational wave detector based on laser interferometry, which measures how a gravitational wave stretches and squeezes space using laser beams (see here for the details). The price for sensitivity was size. The detector would have to be the shape of an L, which each leg of the L several kilometres long. The distortion in distances the detector would have to pick up was, as Thorne calculated, about a 100th of the diameter of the nucleus of an atom. It's no wonder that Thorne had misgivings at first. But eventually he was convinced. "I decided to do whatever I could to help experimenters to pull it off." And he succeeded. In 1984 Thorne and Weiss, together with Ron Drever, managed to convince the National Science Foundation (NSF) in the US to fund LIGO, the Laser Interferometer Gravitational-Wave Observatory. After a rocky start, partly due to Thorne, Weiss and Drever's self-confessed "dysfunctional leadership", LIGO eventually grew into an international collaboration involving over 1,000 people. To date the NSF has funded LIGO to the tune of $1.1 billion dollars — an impressive commitment for the detection of something people weren't even sure existed. 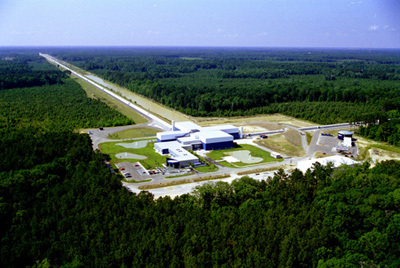 LIGO was being built to test the theory of black holes, gravitational waves and general relativity on the largest scales. But it will eventually encounter challenges from the theory that describes the world at the very smallest scales: quantum mechanics. This famously counter-intuitive theory asserts that when you look at the world at those smallest scales notions like the position of an object become fuzzy (see here for a ridiculously brief introduction). The sound of two black holes colliding. Gravitational waves sent out from a pair of colliding black holes have been converted to sound waves. In the first two runs of the animation, the sound wave frequencies exactly match the frequencies of the gravitational waves. The second two runs of the animation play the sounds again at higher frequencies that better fit the human hearing range. The animation ends by playing the original frequencies again twice. Credit: LIGO. As early as 1968 Vladimir Braginsky warned that any gravitational wave detector would run into quantum effects. "We would be monitoring the motion of very big masses (40kg mirrors in the case of LIGO) with such exquisite precision that we would see them behave quantum mechanically," says Thorne. "We would see the quantum mechanical fluctuations in their position and we would have to deal with them to make sure they would not get in the way of detecting the gravitational waves. It would be the first time humans would see human-sized objects behave quantum mechanically." The theory basis for the detectors therefore had to include a quantum edge, and Thorne, Braginsky and others developed quantum nondemolition technology to deal with this. It's not being used just yet, as the detectors have not come up to sufficient sensitivity, but it will be needed in the future, especially for space-based experiments. Back on Earth, a theoretical effort was needed simply to understand the signals picked up by a gravitational wave detector, such as LIGO. The detector measures a pattern of stretching and squeezing, much like the pattern of a sound wave on an oscilloscope. "It was those waveforms that carry the information about what's going on in the source [of the gravitational waves]," explains Thorne. "You would have to have computer simulations of the sources to produce waveforms to compare with the observed waveforms in order to know what's going on." When experimentalists started to build LIGO, others began working on the technology needed for those simulations. In 2001 Thorne started the SXS (simulating extreme spacetimes) project, which developed the simulations of profound events in the Universe that could produce detectable gravitational waves. The effort was crucial to LIGO's discovery. When the discovery came on 14 September 2015 it took everybody by surprise. The two LIGO sites at Washington and Louisiana were still only preparing for their first search for gravitational waves with then new generation Advanced LIGO detectors, scheduled to begin in just three days' time. As the detectors were being tuned up, a gravitational wave signal hit, first at Louisiana and, seven milliseconds later, at Washington. The two waveforms exactly matched. The signal was so strong it could even be seen by eye. "We were so surprised; we were not expecting it at all," says Gabriela González, Professor of Physics and Astronomy at Louisiana State University and former Spokesperson of the LIGO Scientific Collaboration. Although the theory predicted that pairs of black holes could produce strong gravitational waves in their collisions, it wasn't known if such pairs really existed. And if they did exist, how many of them there were. So the LIGO detectors had intended to instead listen for collisions of neutron stars that produce weaker signals. "We were not expecting to see any signal, and just before we started taking data 24 hours a day this huge signal came to us — huge to us, of course it was tiny, but compared to our noise it was huge — and we just didn't believe it. We thought it was a dream, we thought it was a test. It took us at least a day to be convinced!" 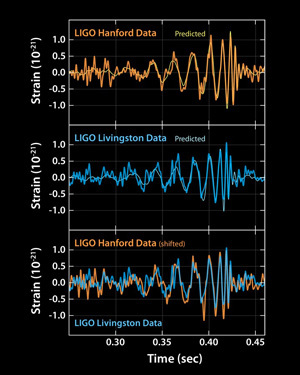 To understand what event had created the signal LIGO scientists compared it with a huge number of waveforms of (simulated) collisions involving black holes of different characteristics to determine which parameters matched best. From their rigorous and tireless analysis (it took five months for a 1,000 person team to be absolutely sure) they determined they had heard the merger of two black holes with masses of 29 and 36 times the mass of the Sun, merging to create a final black hole that was 62 times the mass of the Sun. It happened 1.3 billion light years away. "It took that huge event to produce gravitational waves that, when they reached us, were just a tiny, tiny effect, but we could measure it," says González. The detection promises a brand new way of listening to the Universe. "We have opened our ears in a waveband in which we have been 100% deaf up to now," says Ulrich Sperhake of the University of Cambridge, who is involved with the LIGO project. To find out what we can expect to hear with this new pair of ears, see the next article.